Can You Recommend Some Crystals To Improve My Daughter's Eyesight? Hello, I am wondering if you could recommend a crystal to help my young daughter who has poor vision in one eye. Her vision is improving slowly from patching daily, but I would like to try some healing crystals also. Thank you. Thanks so much for your question about crystals that can help your daughter's eyesight to improve. 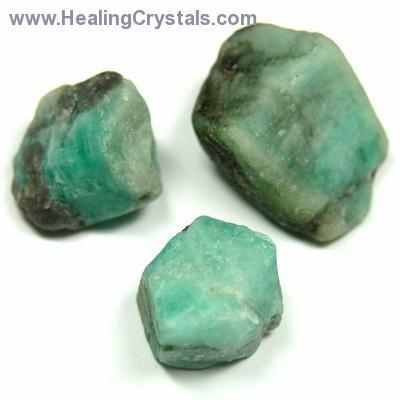 Green Aventurine is will help to strengthen her eyesight - and it is a wonderful overall crystal for children. Emerald assists with healing eye strain which would be helpful since you mentioned that she has a squint. I would place one or both crystals by her head - either on a nightstand or beneath her pillow if you feel it is safe - while she sleeps at night. I hope that she continues to improve and that she feels better very soon. Thank you again for reaching out to us and for your support of Healing Crystals.com. I hope that I have been able to help and that you will not hesitate to contact me with any other questions. Wishing you lots of Love and Light! Please Note: Crystals are for healing and should be used as a compliment to other therapies and not as a replacement for regular medical care. Crystals are not a medical treatment and should not be used as a replacement for medical care. Please consult your healthcare specialist for your particular needs.